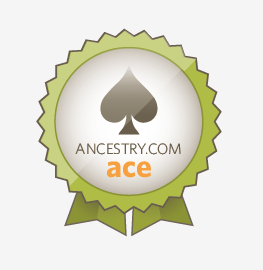 My mother-in-law knew that her great grandfather, Patrick Purcell, was from Ireland, but didn't know where in Ireland. She asked me if I could find out anything about his Irish origins. I started my research back in 2011 and was able to uncover his obituary from June 1894. The newspaper clipping is hard to read, so I have transcribed it below. Patrick Purcell died early early this morning at 675 Bleeker Street, after an illness of nearly a year's duration. About a year ago, Mr. Purcell lost his wife, and since that time has gradually failed until death relieved him of his sufferings. The decreased was born in County Tipperary, Ireland 64 years ago. In 1850 he came to America and has since made Utica his home. Here in the city where he spent the major portion of his life his friends were legion. For over 20 years he was in the employ of the of the Central Railroad, held the position of inspector on the Erie Canal for four year and janitor at the Government Building under President Cleveland's first administration and for two seasons helped to operate the Hotel Street lift bridge. Besides he was several times elected to ward offices, among which was the first Assessor of the Eighth Ward. He was a Jeffersonian Democrat, devoted to his party, and no form was more important to the voters on election day than his. A zealous Catholic, he was always identified with anything that had for its object the advancement of the interests of St. John's Church, of which he had been a lifelong member. He was actively identified with the St. Vincent DePaul Society and distributed its charities. He was charter member of the Utica Lodge, K of H.
Mr. Purcell is survived by his two sons, John F and Patrick W., three daughters, Margaret, Helen and Julia Purcell and three sisters, Mrs. John Connolly and Mrs. James J Harvard of Oneida and Mrs. John Lynch of Utica. Patrick had been born in 1830 in Tipperary, Ireland. Fantastic! Unfortunately, finding out that someone was born in Tipperary, is similar to finding out that they were born inn Massachusetts. Lots of cities and towns to choose from as the possible birthplace. On top of that, Patrick Purcell was not a rare name. I have to admit, I essentially gave up. I was satisfied that I had found the region of Ireland the Purcell family had originated. Searching family of Patrick Purcell b.12 Dec 1830 Thurles Parish, Upper Church, County Tipperary Ireland. He came to Utica NY. At age 22 he married Brigit Dunbar who also came from Ireland. She was b. 10 Sept 1831 in Connert, County Leitrim. Any connections out there? I don't know how I had missed this before, but there was no question that this was the Patrick Purcell and Bridget Dunbar that I had been researching. I thought of replying to the message post, but since it was about 3 years old, I thought it was unlikely that the original poster would be monitoring the board to see if there were any responses. I reached out to the webmaster of the sight and explained that I was trying to track down the poster. He was able to provide me a copy of the posters email address. Only problem was, the email was old and was no longer active. But, I don't give up that easy. I googled the old email address and was able to find the physical address of the original poster. From there I went to one of those websites where you get get someone's phone number for $1.99. I found the poster was named Mary and I gave her a call. After a few awkward minutes, she warmed up to me when she realized I wasn't trying to sell her anything and she told me that she had posted for a friend and that it was her friend that was my wife's relative. She was able to confirm with me that Patrick was from Thurles, Upper Church, Tipperary, Ireland, something I would have never discovered on my own. But probably the greatest discovery was for my mother-in-law, because Mary's friend was an unknown second cousin. She was a few years older than my mother-in-law and they had both grown up living a few miles from each other, but the families had grown apart over the years and they didn't have any interaction. My mother-in-law has often stated how much she wished she had more family, so the discovery of a cousin was a welcome surprise. She and Patty connected and compared stories on their family experiences. I think they will stay in touch. Genealogy has a way of connecting us to past and even to present family members. Next post: "Patrick Purcell's Sisters". My wife's 2nd Great Grandfather, Patrick Purcell, lived in Utica, NY. He was born in Ireland and arrived in Utica as a young man around 1850. He was the first of the Purcell family to come to the US. He lived to be 63. His last job before he died was as night watchman at the US Post Office in Utica. Patrick was a Democrat and lost his job as the night watchman after Benjamin Harrison (Republican) became President. President Harrison took office in March 1899, but Patrick didn't lose his job until December 1899. 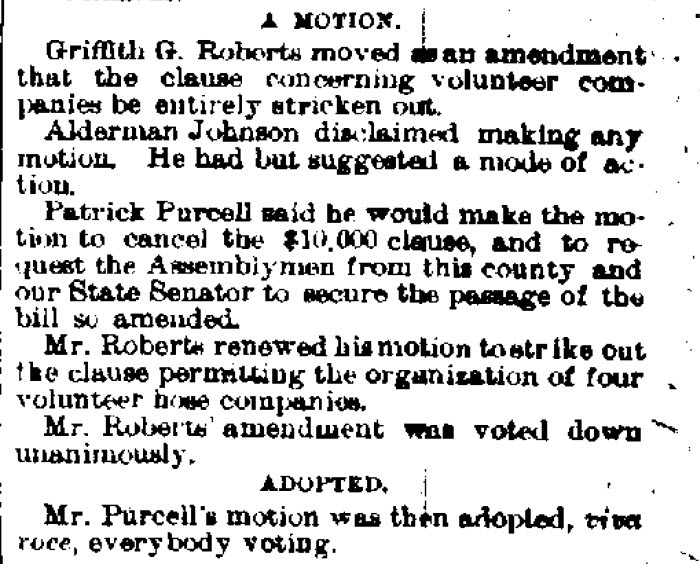 The following article appeared in The Utica Sunday Tribune, December 8, 1899. Patrick Purcell the veteran night watch man of the Government Building, has been relieved from his duties. His place has been filled by the appointment of Daniel Brietenatein, one of the janitors of the building. No complaint was found against Mr. Purcell in regard to his work. For everyone connected with the Government Building knew that the white haired night guardian was most conscientious in the performance of his duties. Being on duty for several years, his face had become familiar to many who frequent the postoffice at night. But "Pat" was a democrat, and somehow or other, ---well, it isn't necessary to say any more on that point, suffice it to state that he has received official notification of his removal. From another source it was learned the removal was based on the fact that the Government is trying to reduce expenses and the change was therefore made. Mr. Breitenatein went on duty last night. It is rumored that in a few days another removal and appointment will be made in the custodian's department. I was fascinated that the firing of a night watchman was newsworthy. Of course, it wasn't, but what become clear was that Patrick Purcell was a very well connected night watchman. He had been active in local politics for years. He served as delegate to annual Democratic Conventions representing the Eighth Ward of Utica. I don't know if he was a Ward Boss, but must have had a significant position within the local Democratic Party and had some influence. So as he grew older, there was no retirement, but he was able to secure a job as a night watchman in a federal building. This would have been a fairly easy job and great for an older person. I bet he contacted the newspaper and had a sympathetic ear from people that had known him for years, hence the newspaper article as a sort of slight protest to his being removed. Patrick must have known how politics worked, probably better than most. In the 1800's politics were run by the "spoils system" which meant that the winning party essentially controlled all the government jobs. When a new party took over all the government employees were removed to make way for new employees who were connected to the winning party. When the new party won, long lines of supporters would show up at government offices looking for jobs. In fact, President Garfield was assassinated in 1881 by Charles Guiteau who had been one of his active supporters and a man who believed his contributions to Garfield's election made him owed an ambassadorship. He was turned down many times for the position and became disgruntled and shot the President. It was after President Garfield's assassination that the spoils system started to break down and was finally eliminated for all but very senior government positions. 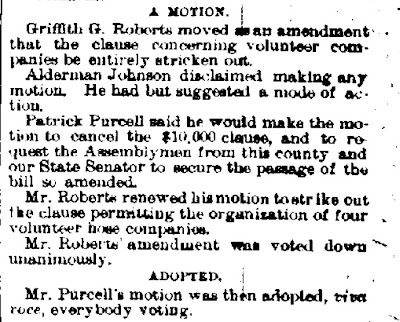 Here is a snippet of an article which shows Patrick Purcell as a critical vote in eliminating a $10,000 clause from a local budget. He must have been a a significant player in local Utica politics. So, Patrick wouldn't have been surprised, when his job was offered to a Republican. Next Post, "Uncovering Patrick Purcell's Irish Origins".